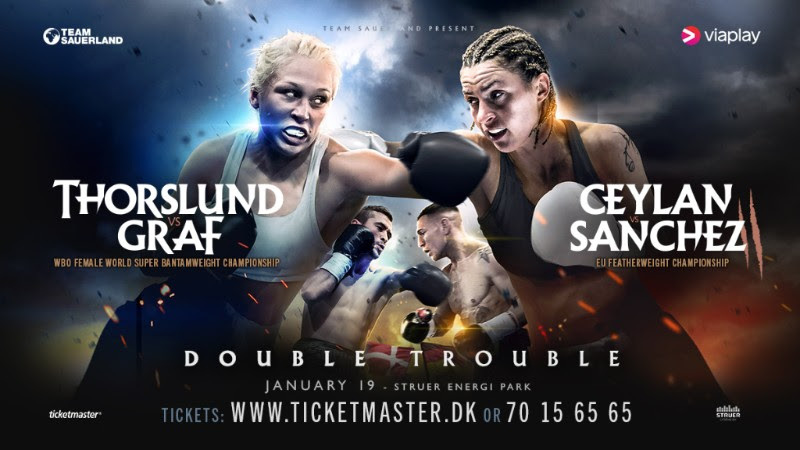 Dina Thorslund (12-0, 6 KOs) defends her WBO Female World Super Bantamweight title against Alesia Graf (19-7, 13 KOs), while Dennis Ceylan (19-2-2, 8 KOs) rematches Jesus Sanchez (9-1, 2 KOs) for the European Union Featherweight title on January 19 at the Struer Energi Park in Denmark. Thorslund returns to her hometown fortress for a fourth time to make the first defence of the WBO World title she claimed with a unanimous points win over Mexico’s Yessica Munoz at the Struer Energi Park on August 25. The 25 year-old is currently Denmark’s only reigning World Champion, the first Dane to have won a World title since Mikkel Kessler, and only the second female in Danish boxing history to have achieved this success. “This will be the fourth time I box in front of my fans in Struer,” says Thorslund. “It has been amazing every other time, and I hope it will be again. It is almost too much to hope for, but so far, the support has only improved each time. It’s hard to describe how much it means to have people in Struer to back me up. Graf, nicknamed ‘The Tigress’, from Stuttgart, Germany, has held versions of the World title in both the Super Flyweight and Super Bantamweight divisions, as well as challenging for the Bantamweight crown on three occasions. She is an experienced contender, who is confident of upsetting the home fighter. Having suffered a shock second-round knockout defeat to Sanchez at the Struer Energi Park on March 10, former European Champion Ceylan has the chance for revenge as he rematches his Spanish rival for EU title. Ceylan has said it is ‘all or nothing’ as he looks to get his promising career back on track on January 19, stating a loss will result in his retirement. Sanchez returns to Denmark full of confidence following his knockout win, and has vowed to get the better of Ceylan for a third-time having reportedly schooled the Danish boxer in a sparring session prior to their first encounter. “We’re delighted to be returning to the Struer Energi Park with another fantastic card,” said promoter Nisse Sauerland. “The atmosphere is always electric when Dina fights, and this time the fans can look forward to a double header of title fights with Dennis challenging for the EU Featherweight title. Tickets for Double Trouble: Dina Thorslund vs. Alesia Graf and Dennis Ceylan vs. Jesus Sanchez are on sale now and available online via www.ticketmaster.dk or by calling (+45) 70 15 65 65.